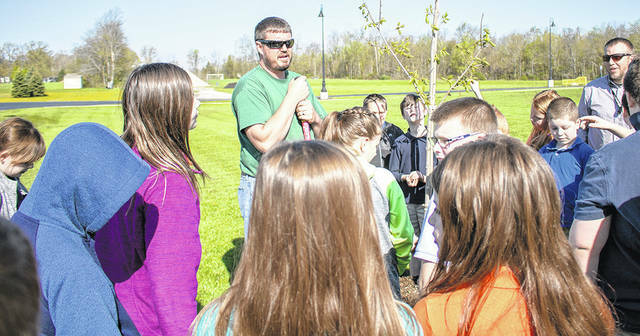 GALION — Oakstone Landscape, a locally-owned family business in Galion, recently donated its expertise to plant four new trees throughout the Galion City Schools campus. The effort was part of the Earth Day celebration. The idea of donating and planting trees on the district’s campus has been a dream of Oakstone Landscape owner Ben Perkins since he started his business nearly 11 years ago. Perkins’ Oakstone Landscape wasn’t the only local business or individual involved in planting the Red Sunset Maple and Red Oak trees on the school property. Locally-owned Galion businesses Flick Packaging and H&K Watkins, along with City of Galion First Ward Councilman Bill Comerford, provided donations to help purchase the trees. Councilman Comerford, a longtime friend of Perkins, contributed to show the Galion students the importance of supporting local businesses. Heath and Kelli Watkins are no strangers when it comes to supporting local businesses and the schools in Galion. The couple knew they had to be involved as soon as they heard about the idea. Three of the four trees are located near the Intermediate School along the access road behind the High School and Middle School. The fourth tree is located near the Primary School playground.